We have an enhanced risk of tornadoes today. 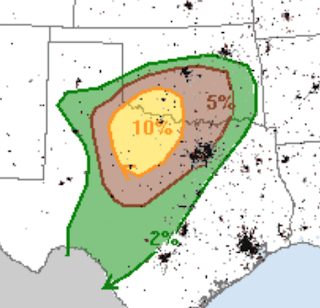 The 5% area (brown) is the significant threshold for tornado risk with includes Oklahoma City and the DFW Metroplex. The 10% area includes Wichita Falls and Lawton. It is important that people in these areas monitor the weather at the first sign of the approach of a thunderstorm. The AccuWeather App does an excellent job at providing severe weather warnings for your location. Very large hail is also likely -- a repeat of Sunday only farther west. On the hail map 15% (yellow) is the significant threshold. As you can see, there is a high risk of thunderstorms producing large hail in the 45% area. The hatching means hail could exceed 2 inches in diameter! Needless to say, put your car in the garage along with anything else you wish to protect. 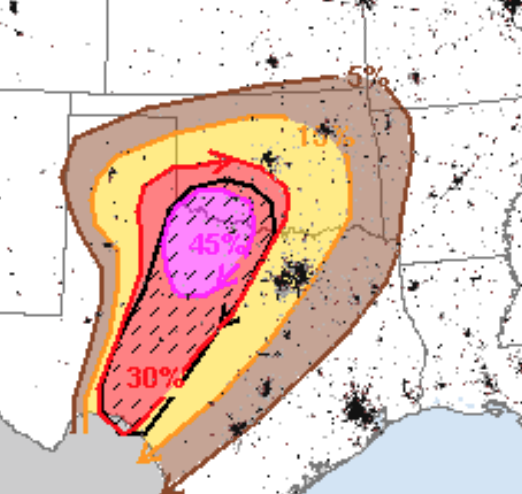 I'll update on these risks later today.